Although vitamin E may appear as though it is a single nutrient, it is actually a blanket term for 8 separate naturally occurring nutrients. Although vitamin E may appear as though it is a single nutrient, it is actually a blanket term for 8 separate naturally occurring nutrients. These nutrients include 4 distinct tocopherols and 4 different tocotrienols that make up the compound, which is found in nature. They are powerful, fat-soluble antioxidants that are necessary to incorporate into one’s everyday diet. This antioxidant offers protection against free radical damage to the fats that line the outside of every cell in the body. Important cell functions are compromised when damaged. In addition, vitamin E also helps to protect LDL cholesterol, also known as ‘bad’ cholesterol, from free radical damage. When you are vitamin E deficient, it is possible for your LDL cholesterol to be insufficiently protected and become damaged by oxygen. The Kyoto Prefectural University of Medicine in Japan confirmed in 2011 that these free radicals play a role in the pathogenesis of atherosclerosis. It was established that the oxidized LDL could possibly accumulate in blood vessel walls and begin forming hardened arteries, a condition known as atherosclerosis. The need for vitamin E for prevention and treatment of this condition was defined in this study. Green leafy vegetables are amongst one of the highest sources of vitamin E. The combination of rich nutrients and low calories make them a very attractive food choice. These green leafy vegetables include spinach, turnip greens, beet greens, mustard greens, kale, and collard greens. Each serving of greens contains approximately 15-25% of your recommended daily value. High-fat foods tend to be high in vitamin E as well. These include nuts, extracted oils, seeds, and fatty fish. With these foods, you should expect to get at least 10% of your daily value. Sunflower seeds, almonds, olive oil, and peanuts are examples of foods that contain a substantial amount of vitamin E. Sunflower seeds are very rich in vitamin E, as ¼ cup is equivalent to 82% of your daily value. Oil-rich plants contain a substantial amount of vitamin E including olives and avocados. Both of these provide about 10-15% of your daily value. Shrimp and sardines contain approximately 10% of the recommended value per day of vitamin E. Salmon and cod are less substantial sources of vitamin E, but nonetheless, are still a valuable dietary source. Vegetables, such as asparagus, chili peppers, broccoli, bell peppers, tomatoes, carrots, and green beans, are all great sources of the vitamin. 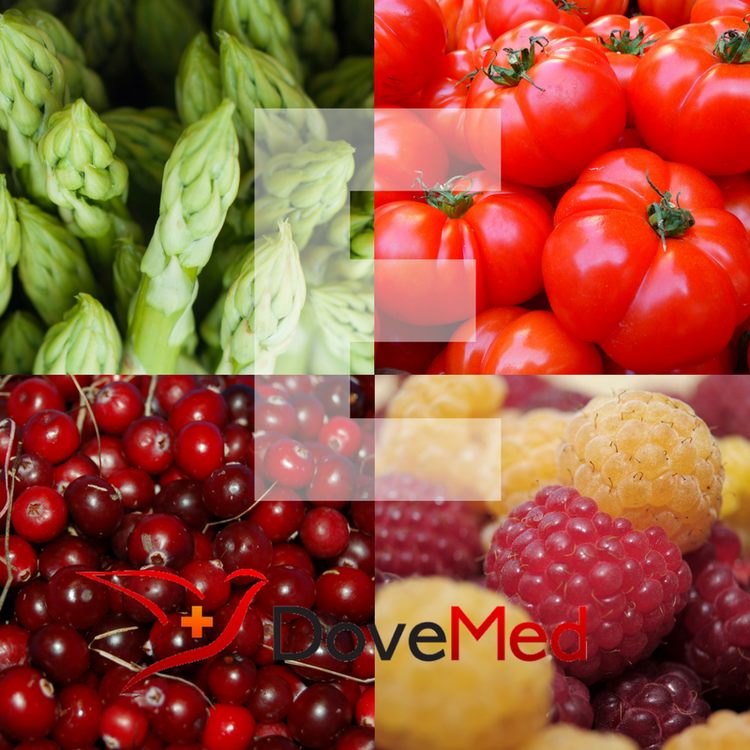 Fruits, including cranberries, raspberries, and kiwi, contain between 7-8% of your daily-recommended value. It is essential to incorporate these antioxidant-rich, vitamin e-foods into your diet by making small adjustments to it. By simply changing your salad to include spinach instead of romaine lettuce, or adding avocados and nuts, you are incorporating these vital vitamin E antioxidants into your diet. Replacing side dishes with green beans, peppers, or asparagus at meals can make a big difference in your daily vitamin E intake. The National Academy of Sciences established in 2000 that an adequate intake of vitamin E for adults should be 15 mg per day. Adolescent teens should get about 11 mg per day, with small children requiring much less, at about 5 to 7 mg per day. It is evident that from the various natural food sources of vitamin E, it is simple to incorporate these foods into your every diet to benefit your health and avoid vitamin e deficiency. Talk to an expert about your current dietary intake and if modifying your diet to include more foods with vitamin E or taking vitamin E capsules is right for you. If you have any food restrictions, it might be recommended to add a vitamin E supplement to your dietary routine. Niki E. Do free radicals play causal role in atherosclerosis? Low density lipoprotein oxidation and vitamin E revisited. J Clin Biochem Nutr. 2011;48(1):3-7. Dietary Reference Intakes for Vitamin C, Vitamin E, Selenium, and Carotenoids. National Academy Press. 2000; 284-324. Eitenmiller, R. R., & Lee, J. (2004). Vitamin E: food chemistry, composition, and analysis. CRC Press. Reboul, E., Richelle, M., Perrot, E., Desmoulins-Malezet, C., Pirisi, V., & Borel, P. (2006). Bioaccessibility of carotenoids and vitamin E from their main dietary sources. Journal of Agricultural and Food Chemistry, 54(23), 8749-8755.